Call for Country Correspondents: Join Us! Remember the first time you left the country without an exact date of when you'll come home? If you slept like a baby the night before your flight, not thinking of how it'll be for you, then you're lucky. You had it all figured out. But if, up until the plane landed in another side of the world, you still felt your heart pounding like crazy because you don't know how it'll be for you in your new environment, then we'd like to hear your story. The fact remains that, no matter how hopeful the situation may be, most overseas Filipinos don't really know what they're getting into until they get to experience the reality abroad. And some were smart enough to stop, rethink, and then take a better route to personal improvement, financial planning, and relationship rebuilding. Many of us, however, are still endlessly running in circles -- living like there's no tomorrow, finding ourselves without any savings, losing our family and friends along the way, and then starting all over again. We at Hay Pinas! don't really know the best answer to the thousand of overseas Filipino problems. But maybe you have tasted the bitter pill and have successfully gotten out of dilemmas like debts, dead ends, or depression. Wouldn't it be great to share it with the world, so that when someone like your old self can read and follow your advice? Share your overseas experience with us. 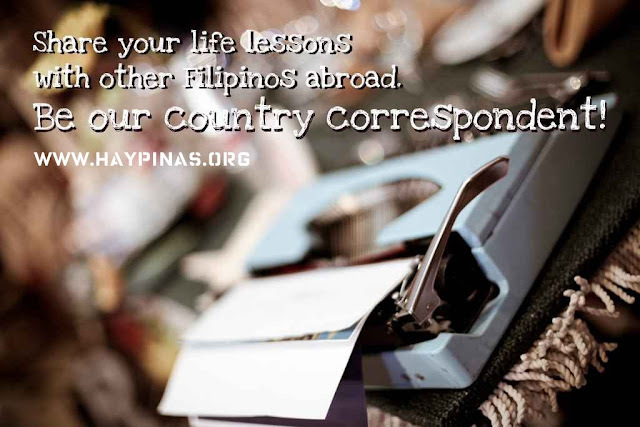 Email an article, a photo, or even a video commentary at feedback@haypinas.org. We have a special place for country correspondents. Visit team.haypinas.org for more info. HayPinas.org is an advocacy web project with the goal of providing relevant content that touch on the experiences of overseas Filipinos. It also tackles issues that may concern prospective OFWs and families left behind. To contact us, send an email to feedback@haypinas.org. HayPinas.org doesn't patronize the concept of OFWs as modern-day heroes. Even if there's a lot of Filipinos willing to make the sacrifice, it shouldn't stop Philippine government and society to pursue real progress for the country. We dream for the day when Filipinos don't leave their families behind just to earn a living. Around one in ten Filipinos have migrated abroad for temporary jobs or for permanent residency. Are you one of us or are planning to go abroad soon? Join our team of contributors or support our cause in social networks such as Facebook or Twitter. You can also start your own discussions in our forums.